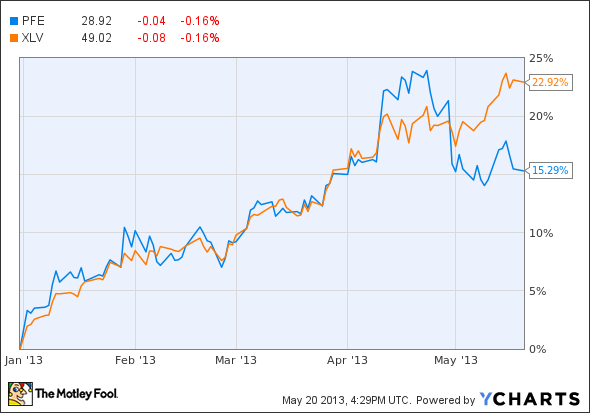 Share are up so far in 2013, but how does Pfizer stock look now? Find out in this month's stock checkup. We dread some checkups. Some people even put them off. If you own Pfizer (NYSE:PFE) stock, though, there's no need for dread or delay. Here is your painless and free stock checkup for the month of May. There's good news and bad news for Pfizer when it comes to performance so far this year. First, the good news. The stock is up by 15%. The bad news, though, is that the last half of April and the month of May thus far haven't helped. 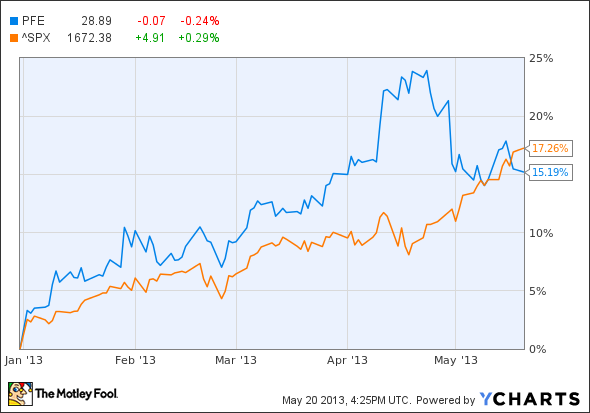 Pfizer outpaced the S&P 500 index throughout much of the year. However, with the broader markets continuing to increase during May and Pfizer stock languishing somewhat, the S&P now beats out the pharmaceutical company. The situation looks even less favorable when we compare Pfizer against the health-care industry. Using the SPDR Health Care Select ETF as a proxy, Pfizer significantly trails other stocks in the industry. Pfizer makes up the second-highest holding in the ETF. More than 11% of the SPDR Health Care Select ETF is in Pfizer stock, while Johnson & Johnson (NYSE:JNJ) makes up 13%. While Pfizer stock might not have outperformed the S&P 500 index or the health-care industry, its valuation appears to be quite attractive. The trailing price-to-earnings ratio for Pfizer currently stands below 14. Pfizer's forward multiple of a little over 12 looks even better. There is one important thing to note with Pfizer's trailing P/E, though. The company recorded $4.8 million in net income during the fourth quarter of 2012 due to the sale of its nutrition business to Nestle. This one-time amount inflated earnings and therefore lowered the trailing P/E. Pfizer also compares well against several of its peers. J&J claims a trailing P/E of nearly 24 and a forward multiple of over 15, both steeper valuations than Pfizer. Novartis (NYSE:NVS) comes in relatively closely behind Pfizer in market cap, but still looks somewhat pricier with a trailing P/E of almost 19 and a forward P/E of below 14. Merck (NYSE:MRK) is more expensive on a trailing basis. However, the drugmaker comes in lower than Pfizer in valuation on one key measure. Merck's forward P/E multiple of slightly below 12 stands a little cheaper than Pfizer's forward multiple. The persistent problem with comparing different pharmaceutical companies' valuations, though, is that their business models and product mix often are quite different despite some similarities. For example, J&J operates a much larger consumer products group than Pfizer does. Novartis' business units include Alcon, which focuses on vision care products -- an area for which Pfizer has no equivalent. Likewise, Merck boasts significant revenue from vaccines; Pfizer has none. J&J sold its animal health unit a couple of years ago. Merck and Novartis still retain their animal health units, but Pfizer spun off its animal health business into Zoetis (NYSE:ZTS) earlier this year. Pfizer still maintains 80% ownership of Zoetis, however. S&P Capital IQ estimates that the fair value of Pfizer stock is around $26 per share. Assuming this calculation is reasonably accurate, Pfizer is around 10% overvalued currently. Note, though, that many stocks trade well above their fair value. In fact, S&P set a target price for Pfizer for $33 per share -- around 15% higher than the stock's current level. If we only looked at recent history, future growth would probably be questionable. Pfizer actually reported an 8% decrease in revenue year-over-year for the first quarter of 2013. Primary care, specialty care, and established products business segments saw sales decreases in the double digits. However, emerging markets and Zoetis continue to contribute solid growth -- both of which grew at 6% year-over-year during the first quarter. Consumer health care and oncology products are growing strongly. Declining revenue from Lipitor is problematic for Pfizer. On the positive side, though, the company counts several new drugs with a lot of potential. Eliquis, Xeljanz, and Xalkori stand out in this group. Looking a little farther in the future, Pfizer and Merck could have a winner with type 2 diabetes drug ertugliflozin, which begins phase 3 trials later this year. My take is that Pfizer should be able to experience slow organic growth. The company does have $45 billion in cash, cash equivalents, and short-term investments. Some of this stockpile could be used in strategic acquisitions and partnerships that spur growth a bit. Pfizer's current valuation discount to several peers reflects its slower growth potential. The stock's performance hasn't been overly disappointing, but it hasn't kept pace with the broader market this year. Investors shouldn't overlook Pfizer's 3.3% dividend yield. With a payout ratio of only 43%, this yield appears to be in solid shape. Also, there's always the possibility that Pfizer in the future will dispose of more of its ownership of Zoetis in a way that benefits shareholders. That's an "if" or "maybe" at this point, but it could happen. There are better investing alternatives in the pharmaceutical world, but I wouldn't bet against Pfizer. For now, Pfizer stock isn't one that I'll buy. However, I don't think it's a bad pick for long-term investors wanting a reliable dividend.